I bought it at an estate sale a few yrs ago. Any info you can provide would be great. I am thinking of selling it. I have more pics if needed. The label is worn bad and I cant read it. you have a delta milwakee drill press dp220 i have two from the early 40's i want to say 1943 to 1945! The one I just found looks very similar. There are raised letters on the left side of mine as you look at the front. It is dp220 I think. I csn read my label just fine. I am wondering when mine was made. If you know anything about them, please let me know. Anything meaning, year built or value!! Join in and write your own page! It's easy to do. How? 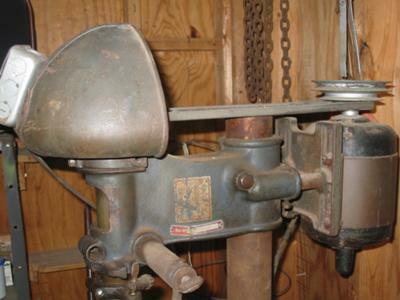 Simply click here to return to Vintage Delta Drill Press.